Otterbein is one of the Buckeye State's better regional liberal arts schools. About 99% of the students on this scenic Midwestern campus located just outside of Columbus receive some type of financial aid, with 97% receiving institutional aid in the form of scholarships, grants and work study. The average amount granted is $10,432. What is a typical Otterbein University student like? Describe the type of person that should attend Otterbein University. What are the top 3 reasons someone should attend Otterbein University? What was a typical Otterbein University student like in high school? Describe the type of person that should attend Otterbein University. Otterbein's story begins in the mid-1800s, before the abolition of slavery, before the women's right movement, before equality and inclusion were rights. In 1847, equality and inclusion actually laid the foundation of Otterbein. We included women as faculty members and as students from our founding, and we were the first institution in the nation to do so. Otterbein admitted students of color before the Civil War, rescued fugitive slaves and welcomed Japanese-American students who had been sent to internment camps during World War II. And we gave students a voice in our story through our unique governance system beginning in the 1920s. Today, approximately 3,000 students come to Otterbein each year to experience that same spirit of inclusion. The mission of Otterbein University is to educate the whole person in a context that fosters the development of humane values. 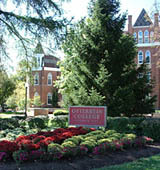 Otterbein University is a private, church-related, coeducational college that sponsors traditional and continuing education programs of liberal arts and professional education at Baccalaureate and Master's levels. Our commitment is to the liberal arts as the broad base of all learning. What are the top 3 things that students do for fun at Otterbein University? Campus housing is available for undergraduates. Housing deposit is not refunded if student does not enroll.. Freshman allowed to have car. Pets allowed in dorms. 57% of students live on-campus. 27% of male students live in fraternities. 87% of students graduated in the top half of their class. The average student pays $25,174 for tuition, fees, and other expenses, after grants and scholarships. Total stated tuition is $31,424, in-state and on-campus, before financial aid. Learn more about financial aid at http://www.otterbein.edu/admission/financial_aid/financial_aid.asp. Estimate the net price for you at http://www.otterbein.edu/estimator/npcalc.htm. The typical (median) early career salary of Otterbein University graduates is $40,500, according to Payscale. Otterbein University participates in the NCAA Division III for college athletics. Want more info about Otterbein University? Get free advice from education experts and Noodle community members. Does Otterbein teach television reporting?